Q1: What actually is plywood? A1: Plywood is one of the most widely used wood products. It is flexible, affordable, workable and can usually be locally manufactured. Plywood is made from thin layers of wood that are peeled from trees. These layers (or the core veneer) are then glued together to make plywood. The grain direction in each layer of veneer is perpendicular to the next layer. 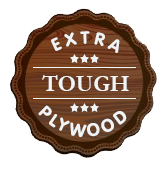 Q2: What makes Woodgard Premium plywood a good choice for furniture? A2: The strength and quality makes Woodgard Premium an outstanding choice. Woodgard Premium’s sandwich structure of thin veneer layers, with the grain oriented at right angles, makes plywood flat and stable. When faced with a high-grade hardwood veneer, plywood looks good and saves time and money. Woodgard Premium Plywood also is structurally stronger than natural wood and has excellent screw- holding capabilities. It is also ideal for door panels, frame panels, drawer bottoms, and cabinet backs. As a shop resource, ply- wood makes strong and stable jigs and color variations. Q3: How to buy ply as per your usage? A3: The best way to buy plywood is to select sheets individually from a dealer with a good inventory. If that is not possible, it helps to know what to ask for. If you’re ordering plywood sight unseen from a distributor, you’ll want to specify several things, including the quality of the veneer on the sheet’s face and back (the face is generally better looking) and the composition and quality of the plywood’s inner core. Q4: How should you choose a veneer? A4: Choose face veneers by cut and match. * BOOK MATCHING is accomplished by turning over every other sheet of veneer for a face that resembles the opened pages of a book, with opposite patterns identical. * SLIP MATCHING uses progressive veneer sheets joined side by side, with the same sides facing up. Book matching accentuates the grain, while slip matching tends to appear uniform, more like solid wood. * RANDOM MATCHING is as it sounds. Sheets are randomly assembled, with the chance of veneer from several logs on one face. This method can lend a very real laminated look, but it also can lead to multiple color and grain patterns in one face.